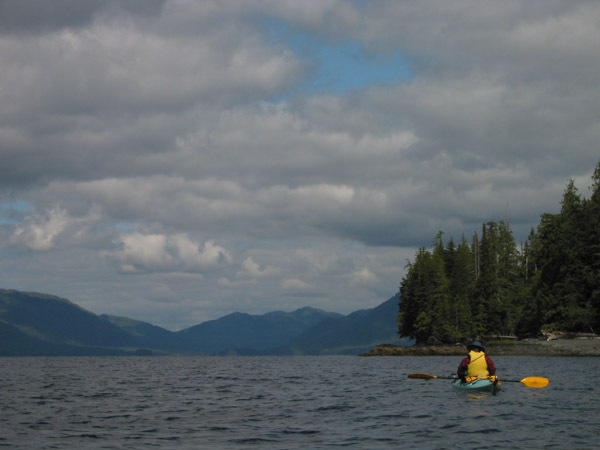 In June 2004, my mother and I put her two kayaks on top of the camper van, and set out on the long drive from Seattle to Prince Rupert. From there we caught the ferry to Ketchikan, and spent three weeks kayaking around Revillagigedo Island, which I still have no idea how to pronounce. Despite the fact that all the weather statistics show the area to be a rainforest, almost every day of the trip was gorgeously sunny, and often hot. Leaving Seattle I was both excited and frantic about this trip. I'm still not entirely sure I haven't forgotten something important. But the three days of driving and the day on the ferry have turned all that anticipation into a sort of calm sense of inevitability. I always seem to be at least one step ahead of myself in planning my adventures. On the drive up here I scrutinized every BC road map for what I could glean of roadless areas, towns, and topography. I looked at the raftability of every river. As we passed through the coast mountains on our way to Prince Rupert, I eyed the landscape for its vegetation, steepness, and the extent of logging. I plan to hike through there on our way to Alaska. That's the next hypothetical big adventure. When Hig and I finish grad school, or whatever, we'll walk from Seattle to some appropriate Alaska destination. Maybe Barrow, or False Pass, or Nome. Or maybe we won't. But it's a great dream to plan for. Despite the fact that I haven't been on an overnight kayak trip since I was 13, there's not much reason to speculate about what we're about to embark on. We're almost in Ketchikan, so it's all pretty well set up to happen. I am excited. But I like planning adventures, and the current gig is never enough. It only gets me thinking of more of them, and I always have to have an indefinite plan or two on the back burner. And now we are mostly gone from Ketchikan. 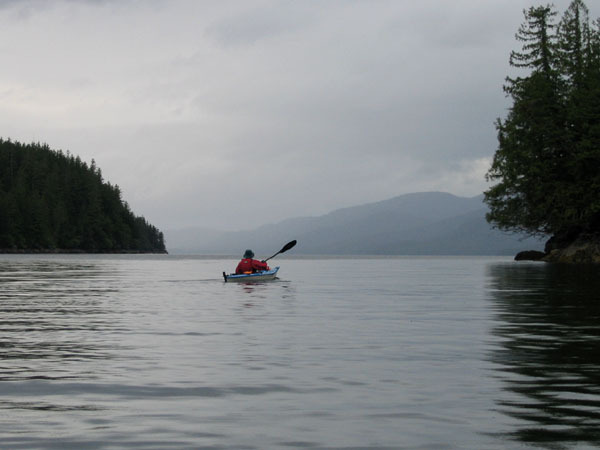 We paddled 12 miles from the Knudson Cove marina, and I can say the houses have gotten sparser as we've left the Ketchikan roads behind. But there are definitely still houses past the end of the road. Beach houses. Boat access is obviously easy, since I'm looking at them all from a boat. But they still annoy me. 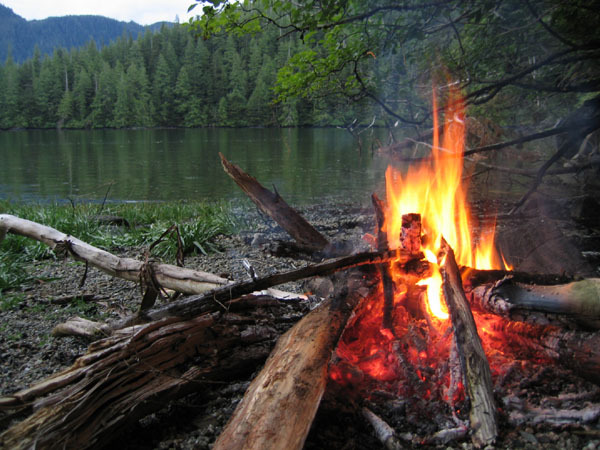 I want to be in the wilderness! I do not want a tour of others' beach homes. I will be patient, as I expect they will continue to thin as we grow further from town. Niki's boat hatches don't fit large dry bags very well. So she did what I've often done with a pack, and filled her whole boat with small heavy bags, mostly containing food. The result was that I was left with a relatively effortless paddle, gliding along in my featherweight boat and trying to improve my paddle stroke. One of Niki's kayaking books said that as you paddle you should move your torso back and forth enough that a bell on your bellybutton would ring with every stroke. It's a silly image, but it stuck in my mind, and it did seem to help. Kayaking feels like an odd blend of meditation, boredom, stress, and excitement. It's more like city biking than like any kind of wilderness travel I've done. The rhythm of the paddle stroke, the rocking ocean, and the sloshing waves works a calming effect on me. I zone out, get lost in my thoughts, and sometimes get sleepy. The sharp smell of the ocean wind and the chop of the waves get me revved up and make me feel the life of the ocean. I fight the wind and move my boat with the larger waves, as they provide the stress and some of the excitement of this form of travel. 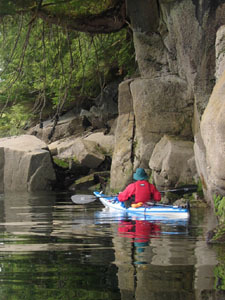 There is always a lot to see from a kayak, but it is all too far away to touch. There's been a northwest wind all day, blowing us back and shoreward. It doesn't seem like much of a wind, maybe 10mph, getting up to 20 in the gusts. But a little wind makes for a hard fight for us. We were ok in the shelter of the islands, but struggling outside of the lee. We were hoping to get further today, but at least this beach is free of habitation. Speaking of which, I saw the oddest contraption in the woods here. There was a small stick nailed to a tree trunk. Dangling from the end of the stick was a bit of fishing line, with a tuft of fur tied to the end, suspended about one foot over a log which was bridging a tiny stream. We saw signs on the beach saying "TRAP 03-04", and other years as well, but I can't imagine how that contraption would trap anything. We took a little walk in the woods on a bear trail this evening. It's a pretty forest. Not much undergrowth here. Moss, bear-ravaged skunk cabbage, and a smattering of all the usuals. There are sword ferns too. I didn't expect them to grow so far north. The dry carpet of the rainforest floor crunched and crackled under our feet, as I tried to simultaneously explain what I know of the habits of bears and to not think of them at all. I haven't seen a bear in about a year. I'm out of practice. But mostly, I think being the designated bear expert on this trip makes me quite a bit more frightened of them than I usually am. I want to see a bear soon - to show Niki a bear, and to show me I can still handle it So far there have only been eagles. Many bald eagles and one Sitka deer. On the first day out I have lost one duct tape lens cap (now replaced) and two paddle gloves (one found by Niki as the waves brought it ashore). Hopefully that will meet my quota for the trip, and I can stop losing things now. Today was a beautiful day for paddling. We had barely a breath of wind, and the weather stayed as bone dry as yesterday. The puffy morning clouds grew together into a mat of gray, and the weather radio tells us that rain is growing more and more likely. The only land life we saw was eagles - swooping about magnificently, and screeching at each other as they squabbled over some prize dead thing on the beach. Eagles seem to be the most common bird here, and are certainly the most noticeable. 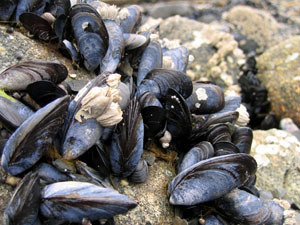 The sea life was more diverse. 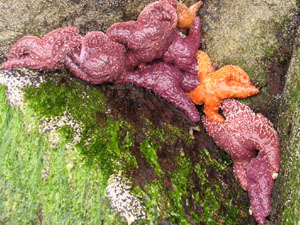 In our float-by tide pools we saw heaps and piles of sea stars, jamming themselves into cracks in the rock, and hanging on by an arm or two when they run out of room. 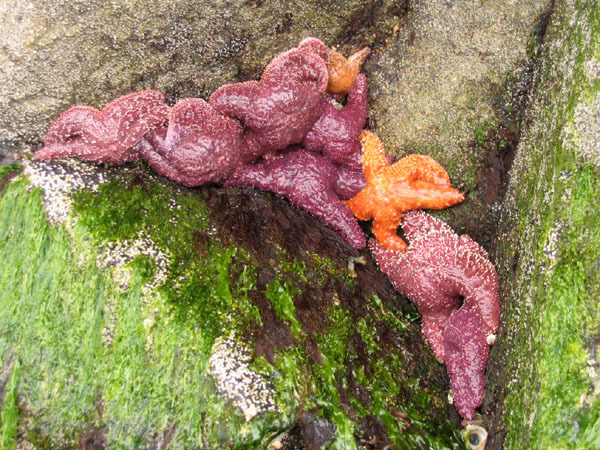 Just under the surface the sunflower stars waved their arms, and the sea cucumbers sat doing nothing at all. I tried to take a picture of the cool flowery anemones, but positioning the camera for an underwater shot from a floating kayak is quite near to impossible. Paddling in the shelter of Traitor's Cove, I was able to practice my seal stalking. I can't sneak up on a seal in a kayak. They see me coming long before I'm even very close, and sploosh into the water. Luckily, they don't seem to take a hint from other seals. 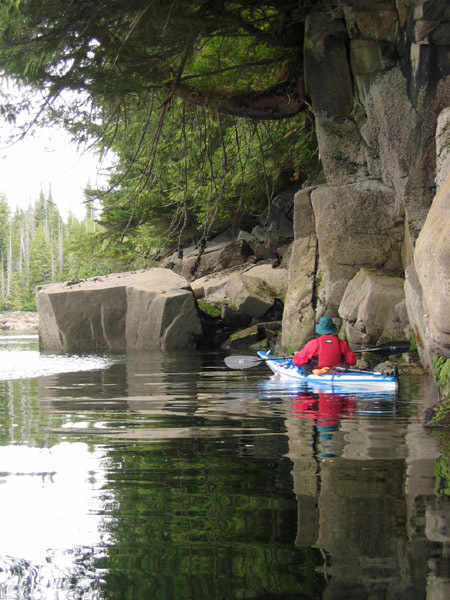 As I slowly paddle up to a seal-covered rock, the near side seal sploosh into the water. But the seals on the far side pay no attention. 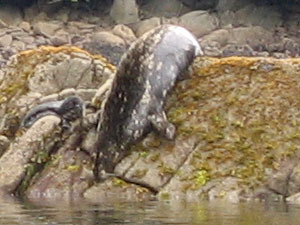 I continue my leisurely trip around the rock, and am now much closer to the far side seals by the time they can see me. 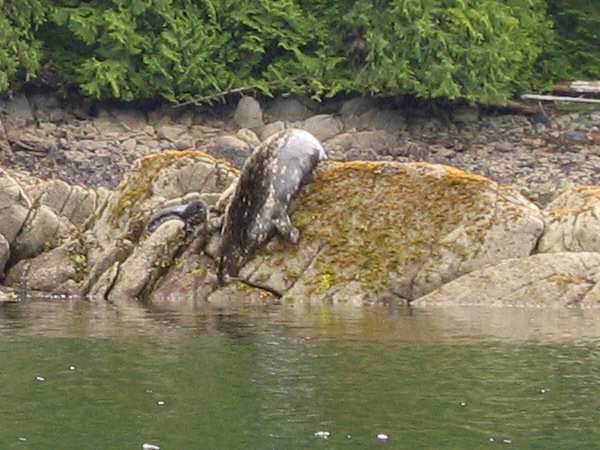 One by one, the seals see me and make their frantic belly flopping gallop down the rock to sploosh into the water. Once they're in, they seem more curious than scared. I had one of them come up close enough to bump the back of my kayak. I'm not sure if that was curiosity or annoyance at my disturbance of their nap. The only people I saw today were far off views of a cruise ship, a small plane, and a couple of motor boats. There was not a single house along our route today. What there was, was logging. At first we didn't believe what we were seeing. The bare patches were so odd-looking. 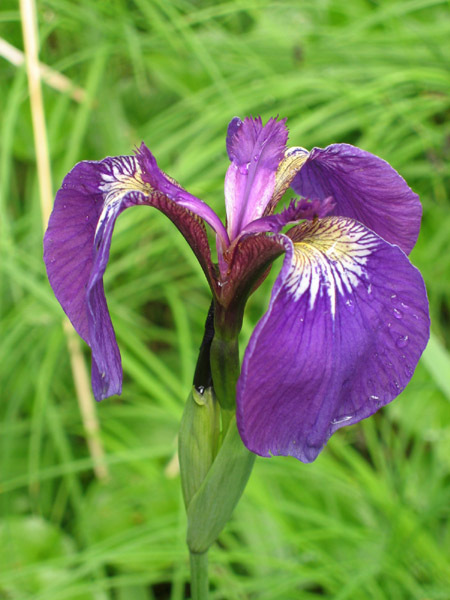 They were irregular shapes, high up on the hillsides, far from the water or any roads. They didn't seem organized in any particular way. 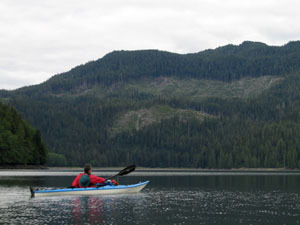 But as we paddled further into Traitor's Cove we saw more and more of them, sporting the unmistakable zig zags of logging roads. 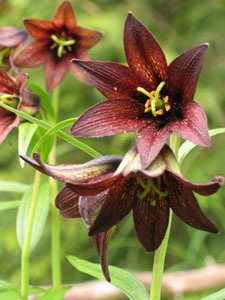 Once we saw them, we were able to pick out batches of shorter trees - areas that had been logged in the past. It's all helicopter logging, I presume. It seems a slimy thing to do, to log in Traitor's Cove. 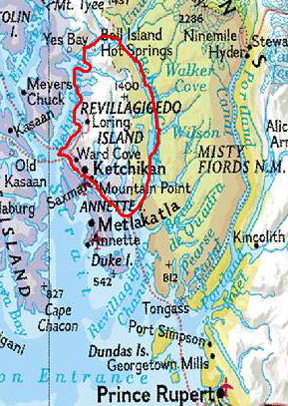 It's far from Ketchikan (the hills above Ketchikan aren't logged). It's far from any road and long past any houses (the hills above the houses aren't logged). Cruise ships don't come near it, and only a very small boat could pass the channel into upper Traitor's Cove. It's sneaky logging. I assume they must have chosen this for logging not for easy access, but so no one could see it, and so no one would care. More fuel is spent and harm is done getting these out-of-the-way logs to where they're going. We stopped at 5 for a hike this evening. We were hoping to hike up above treeline to the snowy peaks, to get a non-sea-level view of this place. But I miscalculated, of course, and we didn't go nearly that far. Treeline seems to be somewhere around 2500 or 3000 feet here, and we only made it about 1100 feet up the slope in a couple of hours. But it was a great exploration of the forest. We picked a non-logged area to hike in. 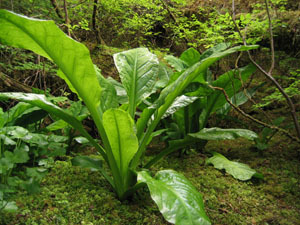 The ridge was laced with small bear trails, weaving around, joining, splitting, and petering out in skunk cabbage swamps where the bear decided to feast. The leaves are usually left lying in a pile, so I think the bears are eating the roots. Somehow their trails were much easier to find on the way up than on the way down. When we couldn't find them, the undergrowth was mostly huckleberries in the difficult spots, and moss and ferns in the rest of it. Like the bear trails, the ridge was much harder to follow going down than up. And it starts getting dark much earlier in the forest than it seems like it ought to. And since I was the only one trying to navigate, I can shoulder all the blame for the ensuing miscalculations and deviations. I'm getting used to the large scale map again. We saw flagging tape in the woods in places. I can only imagine it's there for some logging purpose. I wonder how long that bit of forest is going to be there, as an old-growth forest. I wonder what more "sneaky logging" I'm not seeing. I wonder if even now there's enough forest left that I could hike through it up to the rest of Alaska, or if I am already too late. Setting up and breaking down a kayak camp is way too complicated. Now it's 12:20 AM, and I'm going to sleep and to get eaten by the noseeums that have found their way into our tent. Today we did nothing but paddle. We paddled about 20 miles, and it took us about 6 hours of paddle time. Needless to say, not all of those miles were our own doing. It always takes so much longer to set up or break down a kayak camp than I expect it to. All the food comes out of the Ursacks and everything gets packed up into a slew of little dry bags, of all different colors and sizes. 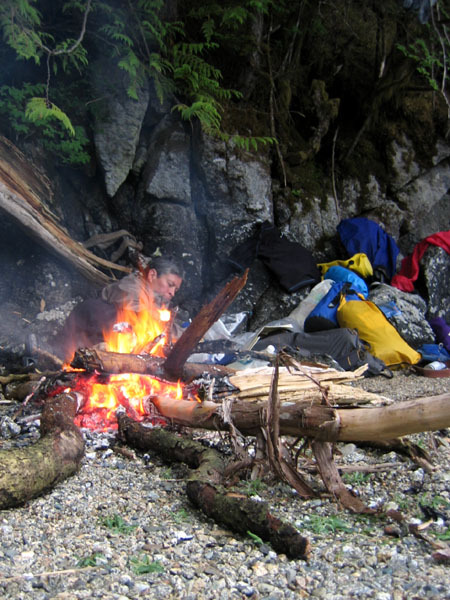 This is only after the Ursacks are fetched, the tent is taken down, the paddling clothes are changed into, the tide table is checked and the breakfast is eaten. Then the kayaks are lugged down to the beach empty, where we attempt to shove a great number of sausage-shaped dry bags into a few unforgiving hatches with a roughly conical shape. Finally, we check the campsite, but on spray skirts and life vests, push off, attach the spray skirts, put on gloves, lower rudders, and paddle away. The whole process takes about 2 hours. We left Traitor's Cove on a high tide. There were only a few seals, and nothing to see on the rocks. 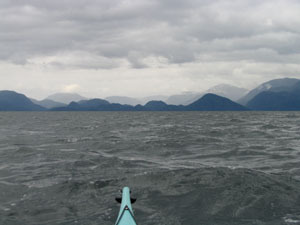 It wasn't as interesting as coming into the cove, and a few blowing squalls of rain had me expecting a storm. But it never really rained. As we left the cove we hit the wind. This time, it was a southwest wind. The swells rode north and crashed into the shore. Now these waves were fun. The weren't too big - only a couple of feet high (and here I'm really trying not to overestimate wave height), and they were going our direction. They were small enough not to scare me, but big enough to keep me on my toes. By all rights, I'm a novice kayaker. In the past couple of years I've done a few day trips. I did a couple of 4-day trips in a double kayak in Puget Sound when I was 12. I've practiced two different rescues, once each. I feel more confident than maybe I ought to, but the boat feels stable and responsive, and I feel like my experiences rafting may help me. The following seas pushed us quickly along, and didn't let us stop to look at much along the way. We cruised past Neets Bay and across Gedney Pass, and reached our planned destination hours before dark. We spent those hours watching the tide rise, debating whether we'd have enough beach left after all. We held of on setting up the tent until the last minute and placed rocks where we thought the tide might get to. Niki guessed lower and won the contest, but delayed here prize of chocolate covered cherries until the morning. We haven't got enough room in the Ursacks for 3 weeks of food. We've been stuffing the extra (the less smelly stuff to human noses) in one of those odor-proof bags in a kayak hatch. I hope that's ok. We still haven't seen any bears. This is a pretty little campsite, now that we know the tide won't eat it. I'm sitting by the remains of our crackling one-match campfire (though it's really not fair of me to boast about this one, since everything was so dry) and it's still keeping away some of the bugs. It's dark enough that I can't see the gash of logging on the hill slope opposite us, but I can still see most things easily. What we could see of Neets Bay had logging, and lots off it. There's some here in Gedney Pass too, though less of it. It was harder to tell across Behm Canal, but I peered over there anyway, second-guessing every shorter clump of trees or possible avalanche chute. I want a map of the logging here. 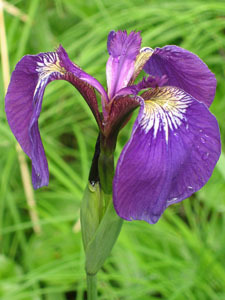 Of the whole Tongass, and B.C. as well. I want to know what's left. The ferry ranger had a list of statistics. 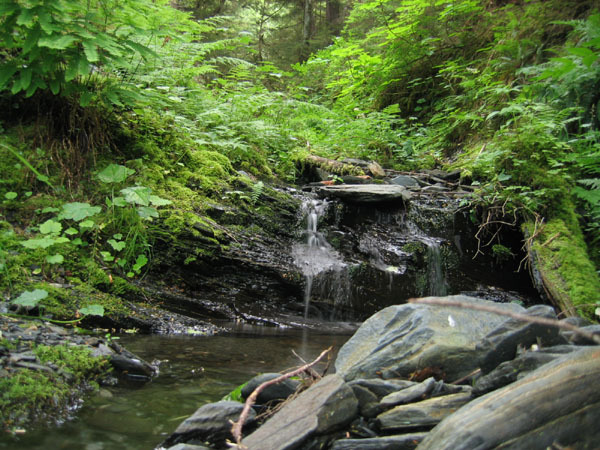 By the numbers, it doesn't sound like much of the Tongass has been logged. 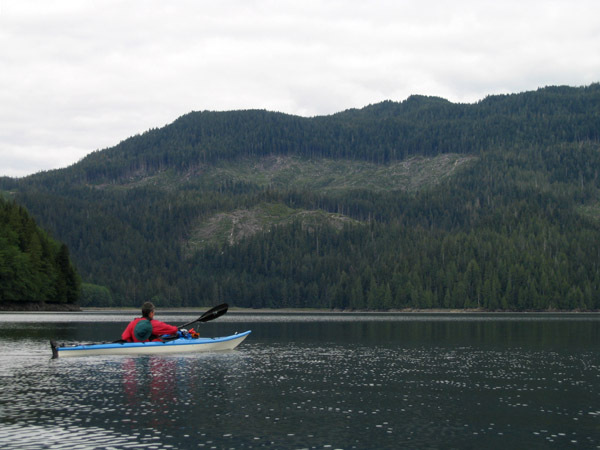 But a lot of the Tongass is mountains and ice fields. Of the forest, 5% has been logged since 1907. Of the harvestable timber, it's 10%. That number is starting to get scary, and when you subtract the wilderness areas like Misty Fjords (which I assume are not logged) it gets even larger. The patches seem so scattered. Like they had to spoil at least a little bit of everything. I can only hope that those trees got used for something worthy of old growth. I don't know what that would be. Maybe fine furniture? What I cynically suspect is that the Forest Service sold them all at a loss to get ground up into whiter paper for the Koreans. I wish I'd learned more before I came here, but I have a lot of questions for when I get back. I'm writing this from a tent in a shelter, listening to the last embers of our campfire sizzle and crackle as they get hit by the rain. The rain is pattering on the shelter roof now, but we haven't seen rain all day. It's fairly dark now, but looking out through the tent window and the open side of the shelter, I can still see plumes of steam coming off the hot springs. Tonight we've left the boats to spend the night on their own (above the high tide line, of course) and we're up at the lake Shelokum hot springs. They're a popular spot around here. 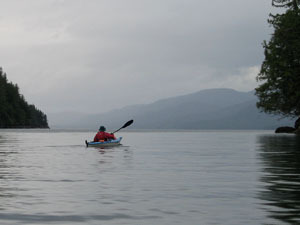 We have now seen exactly two other kayakers on this trip. One of them we ran into this morning - a grizzled old Alaskan who'd just spent 3 days here. 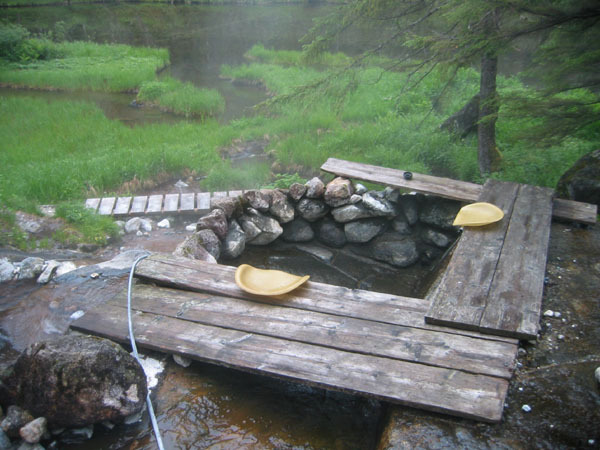 He raved about the hot springs. 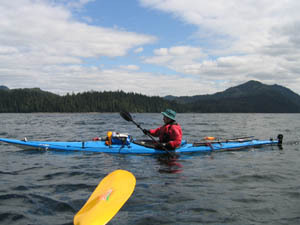 The other kayaker landed at the start of the Shelokum lake trail just as we were packing to come up here. He asked us about the hot springs, but didn't have great English skills, and probably left as confused by our answer as he was before he asked. We hardly paddled anywhere at all today. Maybe 10 miles. Probably not even that, but I haven't checked the map yet. Tomorrow we aren't planning to paddle anywhere at all. We have 3 weeks out here, and unless we want to spread all our time in Ketchikan we'd better not be in too much of a hurry. 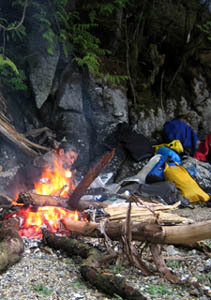 It's a sort of enforced dawdling that'ss new to me on a wilderness trip. Usually food is such an issue that we don't want to carry any more than we really need to get there. But carrying things is easy on a boat. 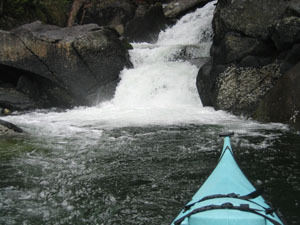 I can add to our list of wildlife: one funny mouse-like creature that came right up and bumped me in the back last night before scurrying into the rocks, one river otter crossing the stream above a waterfall, several more seals, a couple hummingbirds, and the two kayakers. 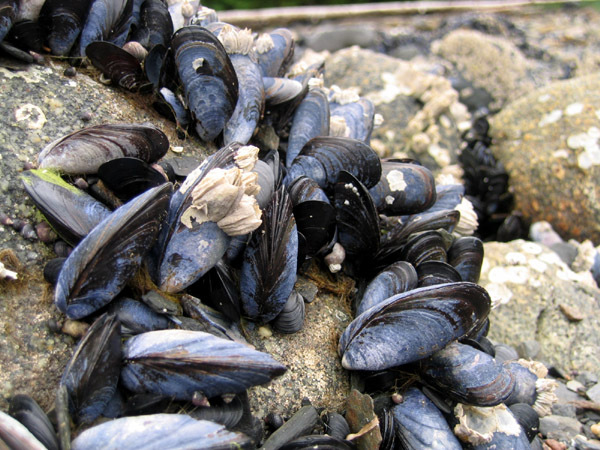 The intertidal life varies more than I would have expected. Today in Bailey Bay we saw almost no sea stars and hardly anything but barnacles and mussels. 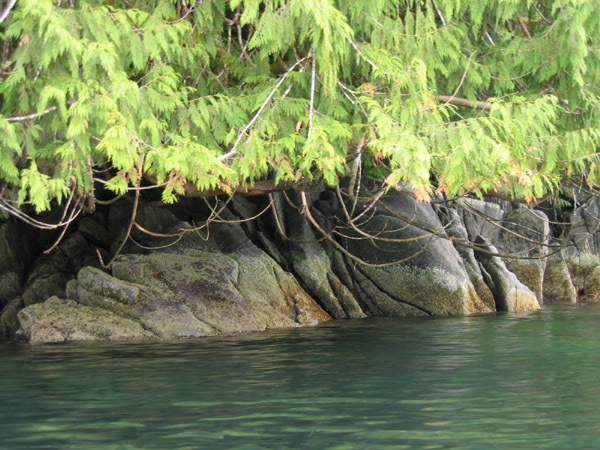 Most of the shoreline is boulders and cliffs right down into the water, with forests dangling precariously over the edge, and barnacles and seaweed encrusting the fallen logs. It never ceases to amaze me that all that mass of forest can be built right on top of the rock, and right out of air and water. The forests we saw today were the luckier ones. 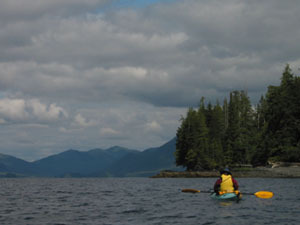 There was very little logging anywhere we could see it, and Bailey Bay seems entirely free of it. I expect it was saved by it's steepness. The trail from Bailey Bay to the Shelokum lake hot springs started out bigger than I expected, but quickly turned to a rocky and muddy rut with bear prints. The outlet of Shelokum Lake is one enormous waterfall, and the creek we crossed to get there was basically a waterfall as well. 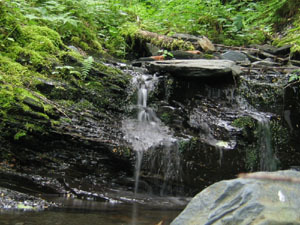 The terrain seems to lend itself to waterfalls here. And to hot springs. 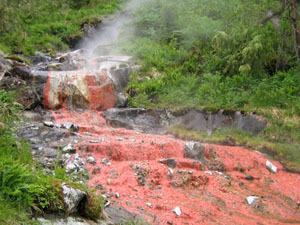 Geologically speaking, I'm not really sure I understand hot springs - other than that I think they're volcanic. Biologically speaking, I'm clueless. 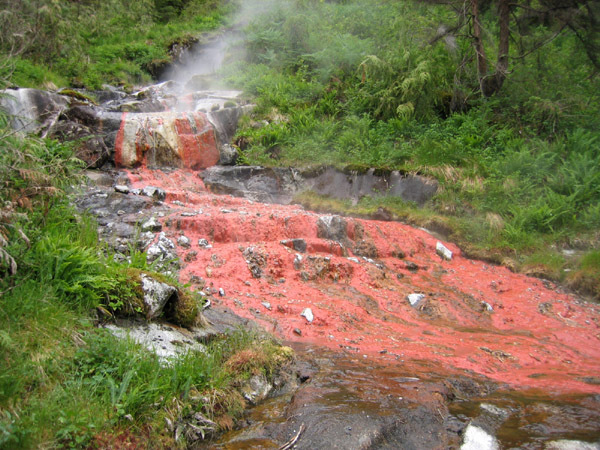 How does the bright red slime algae, which grows only in the hot sulfurous water, ever get here? 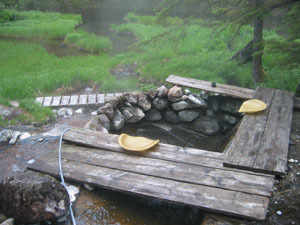 The nearest other hot springs is well over algae travel distance away. This is the first real hot springs I've been to. Really hot. Niki and I arrived at the hot springs, took barely a glance at the setup of beaches and rocks and plastic seats, grabbed the little seats, and immediately started scrambling up the hillside, looking for a pool to sit in. We quickly discovered that it was very buggy in the mucky swamps around the hot springs that the bright red algae in the steaming water looks really cool, that bright red algae means the water is way too hot to want to sit in anyway, and that scrambling up the hillside is probably not the way most people find to enjoy the springs. So we came back down and poked around looking at mucky warm channels, and completely ignoring the obvious. The obvious being a rock pool, lined with benches, right at the end of the trail. The pool was empty, but on one of the beaches was a plug. That fit on a pipe, which drained the man-made pool. We had an enjoyable soak, laughing at our own stupidity. The bugs mostly ignored us in the pool, but this area, is swampy, and otherwise thick with them. Tomorrow we go hiking.